RHYS BOWEN: In two weeks time I'll be in England, joining my closest friends from college for a weekend of good food, friendship and much laughter. Among that group is Jane Finnis, someone I clicked with soon after we arrived at Westfield College, University of London. We found ourselves as co-writers for the freshman review (a rather juvenile attempt at witty satire, I'm afraid). And we remained writing partners, working so well together that it was impossible to tell which of us had written which words to a song. After college we wrote and performed at cabarets together, witty political and contemporary stuff, or so we hoped. We wrote pop songs together, managed a rock group. And then, when I went to Australia, and then America, we stayed in touch, and visited each other. Jane became a successful BBC reporter. When she semi-retired she told me she was going to write a Roman mystery as a radio play. "Why waste that good material on one radio play?" I said. "Write it as a book, instead." And that was how Aurelia, Roman innkeeper in Britain was born and the first book now called Shadows in the Night. So I'm pleased to have Jane as my guest today and hope that more of our US friends will take a look at her terrific Roman Britain books. I should add that this was her university special field and she really knows her stuff! JANE FINNIS: When one of my nieces was young, she asked me why I write about Roman history. Is it, she suggested, because I can remember what life was like then? Answer: “Write about what interests you.” That’s my top tip. Creating a novel can be a long hard slog, and selling it even more so, especially if it’s your first one. You need to enjoy the process and keep your interest alive throughout, because if you get bored before the finish, so will your readers. I’ve been fascinated by Roman history since I was five or six, when we lived in York, with its rich ancient history and many Roman ruins. The visible remains were what first intrigued me, and then I began to realise that despite a gap of two millennia, the Romans were in lots of ways very like ourselves. People find that hard to believe if their classical history has been gleaned solely from Hollywood movies, which naturally focus on the things that are different just because they are different, and therefore more dramatic. Gladiators fighting to the death for sport, slavery, imperialism, democratic ideals perverted by tyranny…you can’t ignore the violence and cruelty if you want to paint the historical background accurately, but they are certainly not the whole story. The Romans believed in many of the same things we do…I should put that the other way round, because we’ve inherited many of our beliefs from them. They knew the importance of law, history, and education; they valued books, poetry, and the arts. On a practical level they insisted on good roads, centrally heated houses, and regular bathing. They enjoyed eating and drinking – forget the gross orgies pictured in films; if you dined with friends at home you’d get a good dinner accompanied by fine wine and maybe by music. They built busy towns, with paved streets and shops and theatres and grand public buildings. A case in point was Londinium, London, the British capital then as now. It’s the setting for the mystery I’m currently writing, and it’s fascinating, with many features you find in London today. It was a major trading centre, bringing the riches of the known world to Londoners’ doorsteps. It was cosmopolitan, a magnet for people from all over the Empire, who flocked there to seek their fortunes. And there was plenty of crime – a must for a good mystery! As I said, Roman history has been a lifelong interest with me. Rhys can vouch for that: she and I were students together in London, and even then I was hooked on the Romans. Years later, I still am. So thank you, Rhys, for giving me the chance to share my fascination with you all. 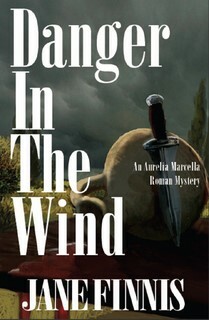 There are four Aurelia Marcella mysteries so far, all published in the USA by Poisoned Pen Press and in the UK by Head of Zeus. The fifth, which I'm working on now, will I hope be out in summer 2014; the working title is BLOOD ON THE WATER. RHYS: Thanks for visiting, Jane, and see you in two weeks. Have the champagne bottle ready! The champagne will be ready on ice, Rhys - looking forward to sharing a few toasts to the old days, and to present and future days too! Love the story of your friendship Rhys and Jane! Old friends are the best, knowing us at a time when we had so much ahead and so much that would shape us! Tell us more about the characters please Jane--the setting sounds amazing! I also love Roman history (call it too many viewings of I Claudius) or my Italian roots. Since I'm new to writing historical fiction a question - if you had to guess, how much of your book(s) is history versus fiction? As someone who loves the historical detail and is trying to seamlessly mesh the two it's not always easy to know when too much detail is too much. ALSO - which book of yours would you recommend that new readers start with? Hi Roberta. Yes, old friends are the best...Rhys and I both knew we'd end up as writers, but in our student days nobody had foreseen ebooks or the Internet! My main sleuth is Aurelia Marcella, who runs an inn on the road to York. I thought an inn would be a good setting for her; a woman in those times couldn't plausibly travel around very much looking for trouble, but with guests and customers visiting all the time, trouble can come to her door! 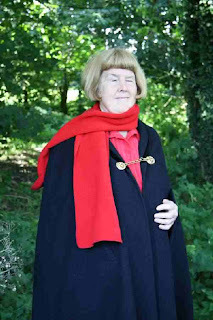 Hi Rosemary, how nice to meet another fan of I CLAUDIUS. Striking a balance between history and fiction is important, but difficult to quantify. Like you, I don't want to overload readers with unnecessary detail, and a lot of the fascinating information I find when I'm researching ends up on the writers' equivalent of the cutting-room floor. I try to filter it in in tiny drops: e.g. you can just write "Marcus drove slowly to the gate and stopped," but more informative to write something like "Marcus drove slowly up and pulled his wagon to a stop at the gate," reinforcing the point that he's relying on animal-power so his "slowly" would be very slow! Only in areas of my period where knowledge is lacking do I let my imagination go...hoping the research I've done will stop me going wildly wrong. Oh, wouldn't I love to be a fly on the wall at your conversations wth RHys! Lovely. I always wonder how authors put themselves in another time..do you sit at your computer, and have..I don't know, a ritual? It's so great to "meet" you, Jane! I love novels based on history and now I've been introduced to a series of books featuring a woman. I love it. Two of my favorite books have always been BEN HUR and QUO VADIS. They were even decent movies but the books, as usual, were far better. I took 5 years of Latin and part of the class was always studying the culture of the times. I look forward to getting into Aurelia's world soon. I'm taking the fly-spray to our reunion, Hank--just in case you're a fly on the wall. Too many items with blackmail potential! And Jane is lucky as she lives in the region she writes about... and it's always easy to imagine the past in England, isn't it? Hi Jane! Oh, you and Rhys must have had the best adventures! And more to come, I suspect. I'm looking up your books right away. I've always been fascinated by Roman Britain, and by the ordinary things about the way they lived. I remember the first time I stood in the fort on Hadrian's Wall--I wanted to catapult myself back in time and see just what they ate and drank and gossiped about. Now it seems I will have some very well-informed help! Yes, you've all guessed right - Rhys and I had some great times as students, and afterwards when we shared a flat (with two other friends) right in the middle of London. Hank, I'm the most disorganised of writers - I don't have a set ritual or a regular working schedule, I just have a target of about a thousand words a day which I don't always meet if I'm doing lots of research as well. I do need a reasonable block of time though, to get myself into my period...can't do fifteen minutes here and there; an hour at least. Or am I just making excuses? Marianne, I'm glad the idea of a woman sleuth appeals to you; I chose a woman main character because hardly any Ancient-Roman writers have! I love QUO VADIS too, and consider Petronius one of the great unsung romantic heroes! I think I prefer the film to the book of Ben Hur, simply for that wonderful chariot race. Deb, I hope you enjoy Aurelia's adventures; she hasn't got to the northern frontier so far (Hadrian's Wall wasn't built yet in her time,) but as she's from an army family she knows a fair bit about military life. She can blow bugle calls, and wears cavalry breeches to ride, but doesn't do either very often as she realises they are not very ladylike accomplishments! I've enjoyed a couple of the books so far and I'm looking forward to reading the rest. Thanks for giving me some insight into a time I knew nothing about. Thanks, Neil, I'm so glad you enjoyed them. Oh! I hadn't been aware of these books, and I love anything about Rome and especially Roman Britain. Studied Latin and classical Roman history and culture for years. Must order them right away! Like Hank, I'd love to be a fly on the wall at your reunion with Rhys, Jane. Old friends truly are the best. I'm so glad you came to visit Jungle Reds today! Your books sound fascinating. My husband and I both also prefer the "Ben Hur" movie to the book . . . partly for the chariot race, partly for Charlton Heston . . . .
Hi, Linda and Joan. Thank you both for your kind comments. I've enjoyed visiting you all at Jungle Red today, and meeting so many fellow-enthusiasts for Roman history. Thanks Rhys and Jane -- know I will love it! Just realized-- I picked up my interest in Roman history in high school Latin class. Hated Latin studies but loved the history. Sorry. That should read, Hated Latin language studies -- not Latin studies. "Written with voice recognition software and management apologizes in advance for any malfunctions in grammar, spelling, or punctuation. Tests indicate that speaking the incorrect words out loud gives the reader a 79% of figuring out what the write words are supposed two bee." Thank the Romans for giving us an idea of "civilized living" and Jane, thank you for a great post about how important history really is. I hope you and Rhys (another of my favorite authors) have a wonderful visit and good luck with BLOOD ON THE WATER. "Good morning, America, how are you?" An appropriate song to start with, because it's morning in Yorkshire and I've found some lovely comments waiting, sent last night while America was still awake and Yorkshire was asleep! Reine, I think the way we learn about the past when we're young is so important, so it's good that your school studies inspired your interested in Roman history. It's sad that the Latin language isn't taught much now; I'm very rusty in translating classical Latin, but when I visit Italy, Spain, or France, I find a knowledge of it very handy in translating the modern languages derived from it. Linda, thanks for your kind comment, and your good wishes. You're right, the very word "civilised" encapsulates what we, and the Romans, considered the right way to live. I wonder what people will consider civilised in another two thousand years? I'm looking forward to Aurelia's visit to Londinium!